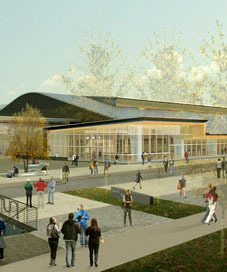 Middlebury College will open its new Field House in 2015. This exciting project, designed by Sasaki Associates (Civil/Site Design and Permitting by OCE) will feature a 6-lane, 200-meter track, 8 60-meter sprint lanes, areas for high jump, long jump, pole vault, and throwing, and artificial turf field for all field sports. This world class facility compliments the College’s other sports venues including Kenyon Hockey Arena, the Olympic size Natatorium, the beautiful Youngman Football stadium and its other athletic fields.